Throughout the years, The Diana Foundation has helped raise more than $1.6 million for community and civic organizations. We are currently seeking applications for our 2014-15 beneficiaries. The deadline to apply is September 8, and area non-profit organizations are encouraged to apply. Beneficiaries will be announced at our annual Country Dinner on Saturday, October 25. 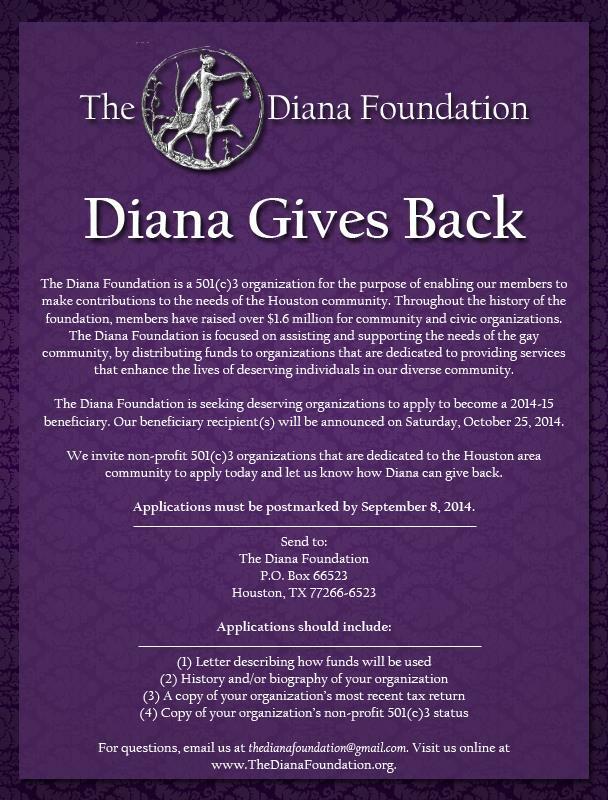 The Diana Foundation is a 501(c)3 organization for the purpose of enabling our members to make contributions to the needs of the Houston community. The Diana Foundation is focused on assisting and supporting the needs of the gay community, by distributing funds to organizations that are dedicated to providing services that enhance the lives of deserving individuals in our diverse community. We invite non-profit 501(c)3 organizations that are dedicated to the Houston area community to apply today and let us know how Diana can give back. Applications must be postmarked by September 8, 2014. Visit our Philanthropy page for added details. For questions, email us at thedianafoundation@gmail.com.